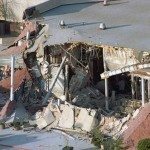 Damage was extensive and large as twenty-five miles of the San Andreas Fault slipped. On October 18, 1989, an earthquake of magnitude 6.9 struck a branch fault of the San Andreas near the city of Santa Cruz in the southern Santa Cruz Mountains. It came to be known as the Loma Prieta earthquake after the name of a 3,000-foot mountain in the Santa Cruz area that was close to the epicenter. A series of thousands of destructive landslides was triggered all along a stretch of coast and in the central valley from north of San Francisco to points forty-five miles south of Santa Cruz. 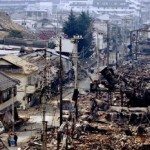 This earthquake took sixty-three lives, cost $10 billion, and damaged 27,000 structures. The source of the quake was a slip along a twenty-five-mile segment of the San Andreas Fault where it crosses the Santa Cruz Mountains sixty miles south of San Francisco. It was the most powerful earthquake to strike this part of California since the 1906 San Francisco quake. Extensive studies were made in the wake of this quake to ensure adequate preparation for any future similar event. For the most part, places that were damaged by landslides were checked out and where necessary, as in some coastal locations, homes were removed or other remedial action taken. One particularly weak area was the Marina District of San Francisco. Despite the experience of 1906 when this part suffered severe damage, city officials went on to fill the area with sand and rubble from the quake, in order to use it as a site for the 1912 Panama–Pacific International Exhibition. In later years it became a very popular section of the city. The lurking danger, which was ignored, was liquefaction in the event of an earthquake. When Loma Prieta struck, the Marina area immediately sunk five inches. 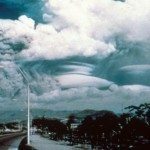 This was followed by widespread liquefaction as water saturated sand turned into a liquid. Buildings shifted off their foundations and many collapsed. Thousands of landslides generated by the quake were found all over an area half the size of the one hit in 1906. Loma Prieta thus provided the first opportunity to study the effects of a major earthquake on landslides. Previous landslide-producing earthquakes, apart from the 1906 quake, were either too small or too poorly documented for this purpose. 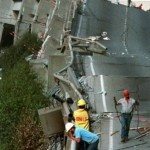 Techniques for identifying slopes susceptible to failure that had been developed over the previous ten years were proved correct in the studies that followed the Loma Prieta earthquake. At the same time there was recognition of new types of landslide hazards not fully appreciated in the past. The most severe property damage occurred in San Francisco and Oakland. The earthquake was felt over most of central California and in part of western Nevada. It was fortunate that the epicenter was in a sparsely populated area because the amount of shaking was very strong. In homes furniture was moved several feet and in one case a built-in oven was ejected from its cabinet. The city of Watsonville was badly damaged as were older buildings in downtown Santa Cruz. Around the margins of San Francisco Bay the shaking that was experienced in 1906 was much stronger than in 1989. Most publicity was focused on the collapse of a section of the freeway that connects downtown Oakland to the Bay Bridge. The freeway’s bridge was built in 1936 and was intended to withstand moderate earthquakes. Such designs were common at that time before people were acquainted with the damaging influence of earthquake motions. This international waterway annually faces the risk of flooding because of the several variables that affect water levels in both countries. 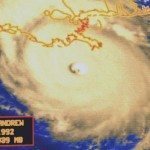 The Red River Flood of 1997, affecting both the United States and Canada, was a major flood that occurred in May 1997 in North Dakota, Minnesota, and southern Manitoba. It was the most severe flood of the river since 1826, causing extensive flooding and destruction on both sides of the border and damaging almost $3 billion worth of property. The Red River originates in Minnesota and flows northward through a large glacial lake basin, that of Lake Agassiz, the largest of the glacial lakes that were formed at the close of the last ice age. It covered an area of half a million square miles and left in its wake a low-lying landscape, almost completely flat in places. The Red River overflows its banks in most years and the low elevation of the surrounding terrain ensures that water covers a big area when that happens. The flatness of the river basin is evident in the gradient as the river flows northward, an average slope of six inches per mile for the whole five hundred miles of its length. Natural levees, five feet in height, rise on either side of the river. The events of 1997 were far worse than anything previously experienced. The river reached the cities of Grand Forks and East Grand Forks, where floodwaters stretched outwards from the river for three miles, inundating virtually everything in these two cities and causing US$2 billion in damages. The situation was similar in Canada. Floods are notoriously unpredictable as the Chinese discovered over the centuries of their history and as the United States discovered with the Mississippi River. In fact, our inability to distinguish between weather and climate in our preoccupation with the advancing global warming has tended to make us attribute every daily change in temperature or precipitation to global warming. Media commentators are worst culprits here. 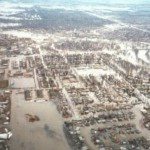 The last time that Winnipeg had a flood like that in 1997 was 1826 and Canadian meteorologists predicted that it would not repeat for a further five hundred years. It came back in about 170 years. There was some sense of imminent threat in Grand Forks but the National Weather Service (NWS) had a long-standing forecast for the river to crest at forty-nine feet, the river’s highest level during the 1979 flood, so people felt secure. The cities had been able to get their dikes to this level, but the river continued to rise past it in 1997, to the astonishment of the NWS that had failed to upgrade its forecast until April 16, 1997, the day the river actually reached forty-nine feet. The dikes over Grand Forks and East Grand Forks area all were overtopped on that day, flooding thousands of homes, and necessitating the evacuation of all of East Grand Forks and 75 percent of Grand Forks. School was cancelled in both cities for the remainder of the term, as were classes at the University of North Dakota. Because all transportation was cut off between the two cities, East Grand Forks residents were evacuated to nearby Crookston, namely to the University of Minnesota, Crookston, while residents of Grand Forks went to the Grand Forks Air Force Base. Many residents also evacuated to motels and homes in neighboring communities. The river crested at 54.35 feet on April 21, 1997, and the river level would not fall below forty-nine feet until April 26 of that same year. Because water drained so slowly out of the most low-lying areas, some homeowners couldn’t visit their damaged property until May. There was $2 billion USD in damage to Grand Forks and East Grand Forks. Grand Forks lost 3 percent of its population from 1997 to 2000 and didn’t fare as badly as its sister city which lost nearly 17 percent of its residents. The five-foot discrepancy between the actual crest and that which the NWS had predicted led to widespread anger among locals, especially since the citizens of both cities reached and even slightly surpassed the NWS’s level of protection through weeks of hard work while raising the level of the dikes. The province of Manitoba completed the Red River Floodway in 1968 after six years of excavation, put up permanent dikes in eight towns south of Winnipeg, and built clay dikes and diversion dams in the Winnipeg area. However, even with these flood protection measures, the province was not prepared for the 1997 event, known as “The Flood of the Century.” At the flood’s peak in Canada on May 4, the Red River occupied an area of nine hundred square miles with more than a thousand additional square miles of land under water, appropriately named the red sea. There were 75,000 people who had to abandon their homes. Damage costs were $450 million. The U.S.–Canadian Mission that looked after the Red River Waterway immediately began to plan for better protection against floods. In retrospect, there were five main factors that contributed to the flood’s severity: (1) rainstorms in autumn of 1996 had saturated the ground so that it could not absorb much water; (2) there was overabundant snowfall during the 1996–1997 winter; (3) an abnormally cold temperature regime plagued the Upper Midwest during this same winter; (4) between November 7 of 1996 and March 18 of 1997 the air temperature reached forty degrees for three days only so there was very little melting of the snow; (5) a freak blizzard dumped a large amount of snow on the area on the weekend of April 5, 1997.